Conroe City Hall is located at 300 West Davis Street, Conroe, TX 77301; phone: 936-522-3000. Photo: North Main Street, looking north from Simonton Street, Conroe, TX. Photographed by user:HIM Nguyen (own work), 2013, [cc-by-3.0 (creativecommons.org/licenses/by/3.0)], via Wikimedia Commons, accessed July, 2013. In 1881 Isaac Conroe established a saw mill on Stewart's Creek near the Great Northern Railroad's Houston Crockett Line, marking the beginning of Conroe's settlement. 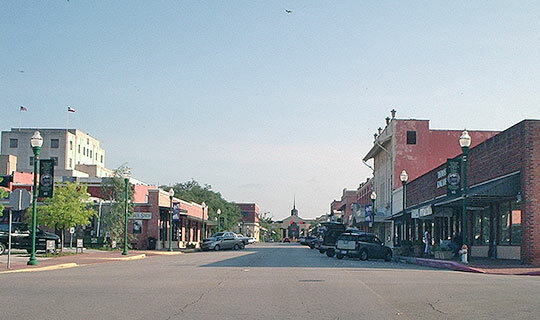 The growth of the lumber industry in Texas' East Piney Woods, and the intersection of two railroad lines in the area, led the settlement to become a thriving commercial center during the late 1800s. Conroe soon became the County Seat for Montgomery County and was incorporated in 1904 with a population of 1,009. The City of Conroe faced economic hardship in the 1920s due to a timber shortage, which was made worse by the onset of the Great Depression in 1929. Hard times did not last long with the discovery of oil nearby in 1931. The Conroe Oil Field boom immediately revived the town and set the stage for a very prosperous decade. The City's success in the 1930s is symbolized by two key downtown buildings, designed in the signature Art Deco style of the time — the Crighton Theatre constructed in 1935, and the County Courthouse constructed in 1936. In more recent decades the growth of the City has been fueled by the availability of undeveloped land within relatively close proximity to the Houston metropolitan area. The City of Conroe, Comprehensive Plan, 2004, www.cityofconroe.org, accessed June, 2012.